You did it! You helped us raise $900 but we always can take more and provide additional funding. It all goes to students. Thank you, donors, for your willingness to help with this important project. We talk often about free speech rights because the First Amendment is dear to us. But do you draw the line somewhere, especially when dealing with offensive speech? With hate speech? We want to pay stipends to more than a dozen student journalists from six Iowa campuses who are interviewing students, faculty members and administrators to learn how people affected by speech and expression on a college campus define what is acceptable. Help these journalists working with the nonprofit IowaWatch answer that question by giving a tax-deductible donation that supports the students’ efforts. Don’t wait. The deadline to donate is Friday, April 8, 2016. A sculpture depicting a Klansman shows up on university property and the university removes it. A student distributing religious flyers is told to stop under the college’s free speech zone regulation. A pro-marijuana group tries to use a public university logo on a T-shirt. A Confederate flag hangs in the dorm room of a student saying he has a right to free expression. Does a limit on speech and expression exist on Iowa’s college campuses, where you expect the free flow of ideas to broaden education? 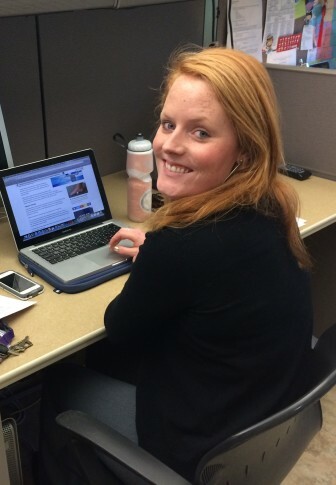 Clare McCarthy at work in the IowaWatch offices during her summer 2015 internship. McCarthy is also involved in IowaWatch's spring college media project. IowaWatch is working with a team of student journalists on six Iowa campuses to advance the conversation about speech rights on college campuses with meaningful thought in a news report that will be published statewide at the beginning of May. This project is a continuation of an annual spring project in which IowaWatch engages journalism students in reporting that examines issues that have impact. Our previous stories have tackled student debt, voter behavior and the exodus of students graduating from Iowa colleges and then leaving the state. A successful crowdfunding campaign last year allowed us to pay students in the reporting project and we’d like to do that again. This year’s campaign ends on Friday, April 8, 2016. This reporting project includes a public forum being planned for Monday, May 2, in Iowa City. We have a site selected but need to nail down details before we can announce with certainty where the forum will be held. We thank KGAN-TV/CBS2 for agreeing to be a sponsor of this event. University of Iowa School of Journalism and Mass Communication event planning students are organizing the forum, gaining valuable experience for when they enter the job market. We thank those students, too. Makayla Tendall, an IowaWatch 2015 summer intern, spoke on KXIC radio in July about her story on Gov. Terry Branstad's plans to address mental health care. Tendall is also involved in the college media project. We hope to raise enough money to pay stipends to students in the spring project but also to students who work on future IowaWatch projects this summer. IowaWatch has an education mission that says we train student journalists to do work that has impact at a high, professional, ethical level. Your tax-deductible donation to this effort rewards further students who already are happy to have the training and to see their work published in Iowa’s largest newspapers. The Iowa Center’s mission is to maintain an independent, non-partisan journalistic program dedicated to producing and encouraging explanatory and investigative journalism in Iowa, engaging in collaborative reporting efforts with Iowa news organizations and educating journalism students. Learn more about IowaWatch’s mission and vision here. IowaWatch Connection Podcast: With Speech on College Campuses, How Far Is Too Far? College traditionally is considered a place where open speech and expression are learning tools, taking students deeper into issues. But does a line exist where speech on campus goes too far? This podcast is part of an IowaWatch college media journalism project in which 14 college student journalists spoke to students, faculty and administrators on six Iowa campuses to discuss whether or not limits exist, or should exist, for speech and expression on campus.